Since 2011 Soufeel products adopt 925 sterling silver and colored gems as main raw materials. With interchangeable charms, you will be delighted in many possibilities by selecting from over 500 designs charms. Soufeel products also encourage customizing your own memorable charms with your themed photos to celebrate your memorable days. First of all the jewelry is very high quality and the idea of getting more personalized charms and bracelets is great. I can choose the charms that matches my personality. I also can remove or add my charms to create different looks. Sometimes I have problems finding bracelets because I have a small wrist and they fit too big on me. However this didn't happen with my Soufeel bracelet because I customized it and it fits perfectly, how exciting! I received a lot of compliments. My friend bought one for her daughter's graduation after seeing mine. I highly recommend these precious pieces to anyone who loves to look back with memories and likes unique pieces because no two bracelets are alike. You will enjoy feeling a sense of comfort when you wear a certain piece of jewelry because with my Soufeel I do! They offer free shipping worldwide with orders over $50 and 365 day return and exchange guarantee, that is something you want to have especially with jewelry pieces. Pink Crystal Heart, this one has crystals on both sides, front and back. 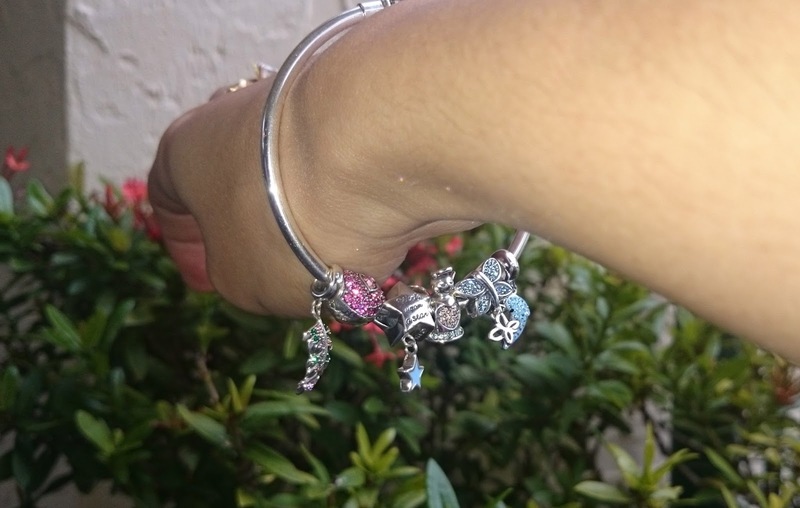 Soufeel charms can fit Pandora, Chamilia bracelets at a lower price but excellent quality. I recommend Soufeel as the best gift selection and they have unique charms for those special persons in my life and yours. You can use my personal promo code at checkout: Diana5off to get a 5% off for any order. I received these products for a review purpose. Regardless, I only recommend products or services I use personally and believe will be good for my readers. Charm bracelets are beautiful and they always make great presents + stylish accessories. In this set, the wish upon a star dangle is my favorite. That's actually a really pretty bracelet. And I'm not even a huge fan of charm bracelets! I love the angel, star, and butterfly charms! I had a charm bracelet as a teenager though I stopped wearing it years ago. I did keep the charms to use in another craft project. I have a Pandora bracelet that needs more charms. So glad to know that these will fit! So pretty! oh wow this is so cool! The bracelet is beautiful! These bracelets are so pretty! I love that butterfly charm. They're so dainty! Just beautiful! I've been seeing these bracelets online and I think they are so stunning. Love the charms. What cute charms for that bracelet. I have a Granddaughter who would love this as a gift. This is so pretty. I am headed over to check them out for my sisters birthday. What a great gift idea! it looks so beautiful! What a great thing to own, even as a gift it would be so amazing! This is so beautiful! I love how they are personalized making it easy to gift them. All of these products are so beautiful. I need to get one of these bracelets for my daughter. The charms are adorable! I am heading over there to check what else they have. I love their bracelet, they are high quality, no wonder they charge so much. THe colors and design you chose is beautiful! What a beautiful take on the classic charm bracelet. It is a great gift item for the girl who has everything. I love accessories and I feel naked without them, but surprisingly, I don't own a charm. I've always been into white gold or gold jewelry. I have to get me one like that. So pretty! This is a beautiful charm bracelet. I love to add charms to mine. I love the angel charm. Omg what a cute bracelet!!! I have a cousin who is graduating at the end of the month. This would make a great grad gift! The charms look amazing. They'd make for a great gift to collectors too. The dolphin charm is my favorite. It looks so beautiful and dainty on your wrist. Wow! This bracelet is beautiful and I really love the charms. You picked some very pretty ones. I love these bracelets and love the charms! I normally don't get into charm bracelets, but I have always loved other type of bracelets. However, this charm bracelet is simply gorgeous! I would wear it in a heartbeat. That is one gorgeous bracelet! I love how you can get so many custom charms for it! My daughter loves jewelry and we are both a little obsessed with charm bracelets. These charms looks high quality and they have a great selection. I love the sparkliness of the bracelet and the charms shown here They also have nice packaging. My favorite charm is the blue dolphin. I was never big on the idea of charm bracelets, but this one looks really cute!! Definitely adorable!